After recently purchasing an Olivia Burton Big Dial Mink & Rose Gold Watch, I realised I have a slight ever-growing love for all things rose gold. And with spring well underway and summer creeping up on us, I decided to take a look through my makeup storage and pick out my favourite rose gold beauty products. One of my most treasured makeup products is the Charlotte Tilbury Filmstar Bronze & Glow and can you blame me? Not only is the product inside simply divine, with two finely milled, super soft powders, one to ‘sculpt’ and one to ‘highlight, the packaging is beautiful. The palette is packaged in a 1920’s rose gold inspired cigarette case and is the prettiest makeup product I own. Read my full review here. It didn’t take me long to purchase the ZOEVA Rose Gold Brushes and this set didn’t disappoint. The 8 piece limited edition luxury brushes have a beautiful rose gold design that set them apart from any other brushes I own. They have been expertly crafted with both natural and synthetic bristles and help to apply my makeup beautiful. They are by far my favourite makeup brushes. 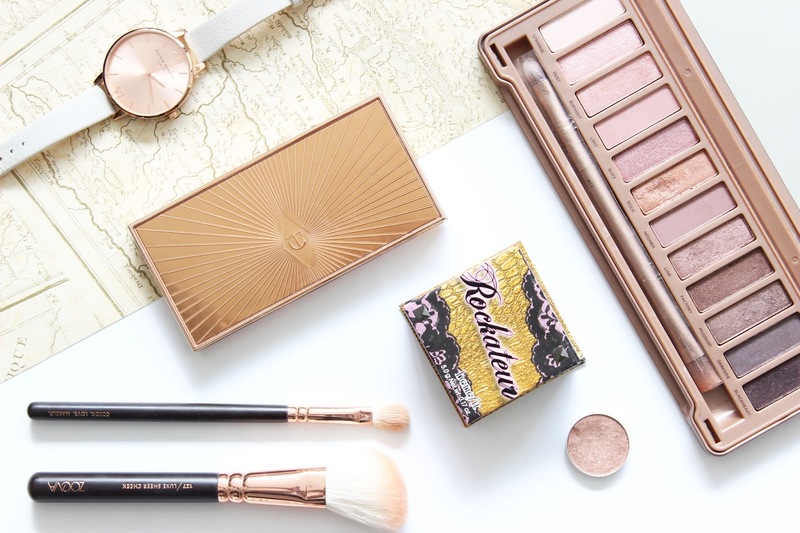 Benefit know exactly how to create wonderful boxed powders and the latest addition to their collection, Rockateur is lovely rose with a hint of gold. The packaging is questionable, but the blusher leaves my skin with a healthy, natural glow. It applies evenly and has the perfect amount of shimmer, making it wearable during both the day and night. How could I not mention MAC’s All That Glitters eyeshadow? This renowned shade is a must have if you love a sweep of rosy gold over the lids. This shimmery shadow is wearable and can also be used as a cheekbone highlight. MAC eyeshadows are highly pigmented, apply evenly and blend extremely well. You can read about my MAC eyeshadow palette here. The highly anticipated Ubran Decay Naked 3 Palette is not only incased in rose gold, but offers twelve rose-hued neutrals all of which are beautiful. The palette offers both matte and shimmery shades like both the Naked 1 & 2 and is fantastic value for money. ‘Trick’ is by far my favourite colour from the palette and is described as a “light metallic pinky-copper shimmer with tonal micro-sparkle.” It’s a stunning copper shade with rose gold sparkles. It does have a little fall out, but overall it has good pigmentation.